You may recall a few years ago, when a chain of failures of so-called “career education colleges,” also known as for-profit colleges, left students with no degrees and mountains of debt. Worse yet, a lot of the credits students earned at these for-profit colleges would not transfer to accredited colleges or universities, essentially leaving students to start their academic careers all over again—existing debt in tow. Those schools, including Corinthian Colleges, which imploded in 2015, and ITT Technical Institute, which closed in 2016, had initially been allowed to accept federal money. But a federal review found that these colleges misled their students through false advertising and exaggerated claims about how many graduates actually got the jobs for which they were training; as a result, the federal government prohibited for-profit colleges from accepting federal student aid money. What happened to the students who were left without degrees and with a ton of student loan debt? The Obama administration “forgave hundreds of millions of dollars in student loans and began rewriting regulations to crack down on predatory institutions and bolster borrowers’ ability to seek debt relief from the federal government,” according to the New York Times. That is, until Betsy DeVos came along. Civics Lesson: What Is a For-Profit College? Unlike most colleges and universities, which are historically nonprofit organizations, for-profit colleges are operated by private businesses seeking to earn profits. Supporters of for-profit colleges say the profit motive encourages efficiency, but the for-profit college industry has received massive criticism because of its high-pressure sales techniques, high costs, and poor student outcomes. Researchers also found that in 14 out of the 15 for-profit institutions they studied, the tuition was more expensive than a public university of similar size, and in 11 out of 15 cases, tuition was higher than its private counterpart. In June of 2017—just one month before the Obama rules would have gone into effect—DeVos said she would block and rewrite them. And now that The Grinch Who Stole American Public Education has established herself in her role as the Secretary of Education, she and the Trump administration have put forth a proposal to change the rules…and not in favor of students. First, the proposal would require borrowers to prove that they are in very deep financial stress in order to file a claim for debt relief. Students would also have to prove that the for-profit colleges they attended deliberately misled them. Applicants would have to divulge “personal information that impacted their job prospects beyond their college experiences,” including health issues, drug test results, and performance evaluations from jobs they had held. The proposal also attempts to define a federal standard for what “misrepresentation” means, in terms of college recruiting efforts. It would require that claims show the colleges’ “reckless disregard” through false or deceptive claims. The new rules would also give higher education institutions accused of fraud a chance to review students’ claims and respond to the Education Department with evidence in their defense. In a statement, DeVos explained the proposal. She said the proposal provides “clear rules of the road for higher education institutions to follow” while “holding institutions, rather than hardworking taxpayers, accountable for making whole those students who were harmed by an institution’s practices.” She added that the Education Department is committed to protecting students from fraud. 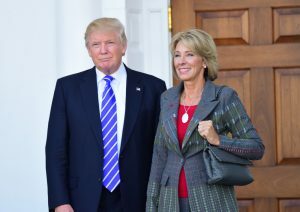 But is she really committed to protecting students from fraud? DeVos has installed two advisors—senior counselor Robert Eitel and senior advisor on postsecondary education Diane Auer Jones—who both, ironically, happen to be former executives of for-profit colleges. And the Department of Education’s general counsel, Carlos Muñiz, worked as a consultant for a for-profit college corporation that paid $10.25 million in a settlement with the New York Attorney General about misleading claims made by for-profit colleges. Advocates for students have a few things to say about DeVos’s proposed rules, too. 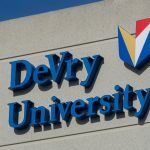 “With a stroke of a pen, Secretary DeVos and her team of former for-profit college executives have proposed giving fraudulent institutions de facto immunity while effectively stripping their victims of a realistic path to debt relief,” Aaron Ament, president of the National Student Legal Defense Network, told the New York Times. The Department of Education plans to solicit public comment on the proposed rule changes for the government’s student debt relief program. It might not be a bad idea to keep an eye on the DOE’s website so you know when you can tell DeVos exactly how you feel about her proposal.